Cities are the future. Currently, 54% of the world’s population – around 3.8 billion people- live in cities and that’s not stopping anytime soon. Between now and 2050 the world will witness the largest wave of urbanization in history, as 2.5 billion human beings will flood into cities. That means that cities are the dominant structure of organizing of human life now and for the foreseeable future. With that being said, how often do you think about the city or town around you. We’ve become so familiarized with the buildings, parks, roads, businesses, and public transit around us that they seem as invisible and natural as the air we breath. The only time that I take the time to notice the city around me is when there’s something new. Whether it be the Kmart closing down or construction on the freeway, I take a mental note of the changing scenery. But even then, my only thought about these new parts of my town is, “hey there’s some new parts of my town”. I never think about my town’s design. And for something that guides my actions everyday – how I get to work, where I can run – my ignorance is a glaring oversight. What do those new condo developments mean for the city? Is the influx of newcomers sustainable economically or ergonomically? Are the people that are building those condos asking these same questions? The non-profit social movement, Strong Towns, says that they aren’t. Founded by Civil Engineer and Urban Planner, Chuck Marohn, Strong Towns believes that “we’ve given almost no thought to whether future generations will be able to afford to maintain the world we’ll leave them with—or how many of the things we build are making our communities worse places to live today.” Strong Towns has several solutions to our mindless relationship to how our towns are being built. They believe that urban planning should be incremental, adaptive, and resilient. To help spread this message, Strong Towns has been producing The Strong Towns Podcast since 2012. On that show, Chuck Marohn interviews interviews other urban planning experts and discusses the movement as a whole. Late last year, Strong Towns launched two more podcasts that approach familiar themes from new perspectives. One being It’s The Little Things that features various local leaders and their efforts to improve their towns, and the subject of today’s Chasing Pods, Upzoned. 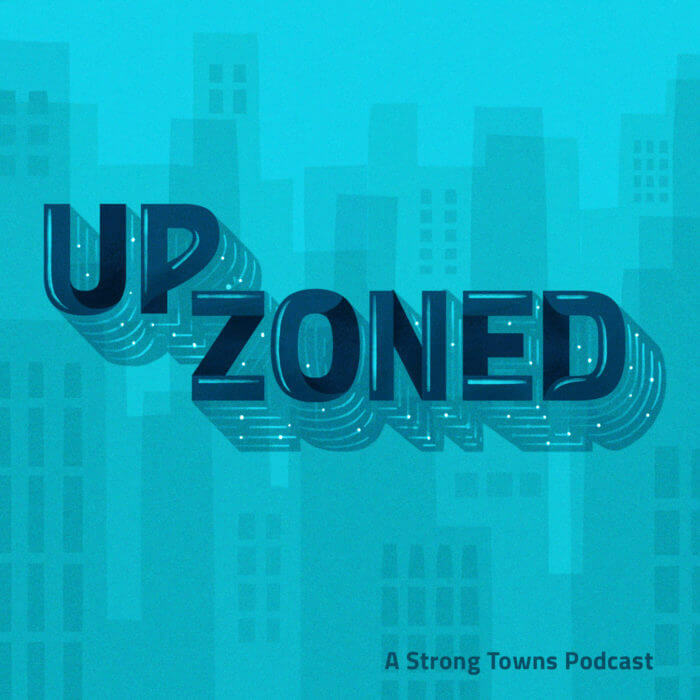 While Upzoned covers the same topics as Strong Towns, the show has the same intentions to proselytize the movement’s grand strategy. Instead, Chuck and Kea join the larger discussion of urban planning beyond their organization by responding to the relevant news of the week. They analyze both current events like California’s plan to build 3.5 million homes in 5 years or about the surprising history of “How the Garage Became America’s Favorite Room”. At the end of each show, the duo also highlight some of their mutual interests beyond the Strong Towns movement in a segment they call, “downzoning”. It’s a simple segment where they share the media that they’ve enjoyed in the past week, but it exemplifies Kea’s favorite part of recording Upzoned; simply talking to her good friend about the topics that they’re passionate about. In addition to being entertaining, the personal touch of the “downzoning” segment is a really unique way to increase interest in their non-profit. The Red Cross doesn’t have public personalities and leaders for the public to rally behind, but Strong Towns does. Kea shares her audiences passion for the latest news stories. Every week, she loves to hunt for fascinating and challenging news stories to discuss with Chuck. The headlines they discuss aren’t sensational, but that doesn’t make them any less fascinating to Chuck and Kea. Ultimately, it’s their passion that continually keeps me reading along with the hosts, and returning to Upzoned week after week. So if you’re looking to learn about the design of the town around you or if you just love a thoughtful conversation, give Upzoned a try and review the show on Podchaser! Do you love or make a cool podcast? Do you want to be featured on our blog? Email Morgan (morgan@podchaser.com) to tell her why your favorite show should be featured next.